In Panajachel, Guatemala, we met Sergio Barrios. He is a man from Chile with the most beautiful dreadlocks I’ve ever seen. We found him on the street at dusk, working his puppets, a pair of very grungy men in a quaint park. One of the puppets is a drunk, a man who drinks from the bottle he holds in his hand and passes out on the ground of the park. The other one is a painter, holding a brush in one hand and a dirty rag in the other. His apron is smeared with paint spatters. His easel is set up to one side of the park, and to my amazement Sergio was able to make him actually paint, dipping his brush into one colour and then another, rinsing with water in between. What was incredible was that these grungy puppets with papier mache heads, hands and feet, and clothes sewn from old rags, came so totally alive. They each had their own personality and conveyed so much without a hint of spoken word. They interacted with the audience, they asked for a tip through their gestures and body languages, they expressed all manner of emotions. I was mesmerised, totally drawn in. When the show ended I stayed and talked with Sergio and we struck up a connection almost immediately. Perhaps it was the dreadlocks, or maybe he just liked to have his work admired – whatever, we talked for quite a while. We introduced Sergio to Pathik, a mosaic artist we had met, so that Sergio could perform at the opening of Pathik’s art exhibition. Pathik had asked me to perform but I haven’t anything here – no hula hoops, no adagio partner, no costume … I’m on holidays. Sergio’s act was perfect – his grungy puppets matched so well with the art on display, and like I had been, the audience were mesmerised and delighted. I could tell he was nervous beforehands – he was putting a lot of extra effort into setting up, he wore a special outfit – his wool spencer with a pair of pants and a piece of black fabric tied around his waist in the manner of a skirt. He had excellent stage presence and spoke very dramatically in Spanish. He asked Paula to interpret a small part of his speech and she stood with a piece of paper in her hand to issue forth his words when indicated. This made her (and us) famous, as the exhibition was full of the ex-pat gringos who live around here, and suddenly people thought we were one of them, that maybe we live here too. I had said to Sergio that I would love to learn the puppets, or marionettes, as he called them, and he offered to show me some. We met at dusk by the lake, and he taught like an old master – strict, unencouraging, his way is the only right way. I didn’t care, I just wanted to learn his technique. We started with the head. I was not permitted to move any other part of the marionette, only the head, and it had to be just so. When he was finally satisfied, I was allowed to move the arms. Then eventually try walking. This was as far as I got on the first day. My walk was a lopsided shuffle, and the marionette sagged under my instruction. With a scorching expression, Sergio straightened the marionette’s posture, and I felt like a naughty ballerina who had been slouching at the barre. So many things to remember at once – the eye gaze has to be perfect, the back has to be straight, the movements fluid. He gave me sequences to practice and I did them over and over. I began to understand that the secret lay in finding the eye gaze and posture, then keeping my right hand absolutely steady so these would not be lost, while I operated the arms or legs with my left hand. 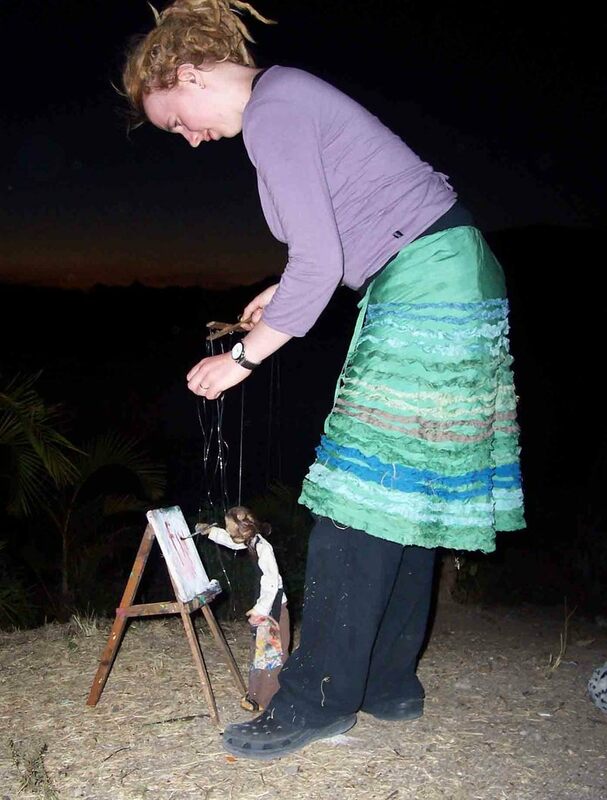 I was totally rapt with the discovery that in a single lesson I had managed to make the marionette come alive, even if somewhat saggy and jerky. I knew that with practise, I’d be able to do it. When it was over for the evening, I told Sergio that I would go home and make one myself. He offered to draw for me the construction details, and we agreed to meet late, at 9pm, with my sketchbook. We sat facing each other, crosslegged on the footpath, and got to business almost immediately. He talked in Spanish, and with difficulty we were able to translate many of his words to English for my benefit. I discovered, to my amazement, that I was able to understand a surprising amount of his Spanish. His Chilean accent is far easier for me to follow than the local Guatemalan patterns of speech. I picked up a lot of his language, and was able to use it back to him, no doubt with utterly incorrect pronounciation, but it enabled us to understand each other. Sergio’s marionettes are mostly wood, with hands, head and feet of papier mache, and an incredibly complicated dowel joint at the knee which allows the knee to bend back but not forward. There’s no way I have that kind of skill with wood to create that joint. My mind was already casting around to work out who to ask for help. My second lesson with Sergio was very satisfying. I actually made the marionette paint! I concentrated hard, kept the posture straight for much more of the time, flitted in and out of having the correct eye gaze, and had several moments when it all came together beautifully. I had the marionette lie down on my sketch book so I could trace around him, making for myself a pattern for my own marionette. This time as well as painting, I made my marionette lie down and sleep. I watched hard while Sergio operated his, and discovered that despite his old-master attitude, now that I knew some of the technique, Sergio’s work was not actually perfect. This gave me a lot of hope. And breakfast with Paula on our last morning in Panajachel, Sergio told her that I am talented, that with practise I will be very good. Now that is music to me! Since then I’ve been dreaming non-stop about the marionettes. I discussed in detail with Paula the methods of construction, how I don’t have the confidence with wood, and somehow it came to me that rather than waiting till I get home, I should start right now. So yesterday when Paula and Jesse went on a tourist hike, I stayed at the hotel and put to work Pathik and Chiko’s method of making papier mache grout. I used newspaper and glue and since I didn’t have anything better, used Jesse’s potty as my mixing bowl. This picture is my first draft of a face and hands. It’s rough, partly because it’s my first go and largely because I didn’t mush the paper as finely as I should have. But Sergio’s marionettes are rough, at least as rough as this. Now Paula and Jesse have gone on another tourist outting to see volcanos, and I have an entire seven hours all to myself. Such a luxury! I have begun by having a good write here, and my next step is to work on my new batch of papier mache grout until my favourite café opens for breakfast. Over breakfast I will finish the cat I’m sewing, then I’ll come back here and make more of my marionette. I think it’s not too bad for a first go, and it definitely has the appearance of some of her faces, and is very different to other faces I’ve drawn, which I’m happy about because I’m trying to branch out a bit. I tried to get the expression a bit thoughtful and with the potential to be considered happy or sad, given that the marionette will need to convey a range of emotions. I think I captured “thoughtful” but not sure that she would really look happy. I’m not stressing too much. I also tried to make her look directly at me but she’s actually slightly unfocussed and gazing a bit to the left. Perhaps if the light hits her eyes from underneath I can achieve it. Next step is to try out a similar face on some fabric rather than paper. The book suggests all sorts of fabric pens, dyes, paints etc that I could buy but I’m really trying not to splurge too much on this kind of thing. I will see if I can get it to work with good old fashioned coloured pencils, and maybe an iron to help set it. I’m so pleased with how my marionette is turning out. I’ve put almost all my focus on her since the last entry, and have split her torso at the waist so that she bends, completed her hands and feet, and added rope arms. 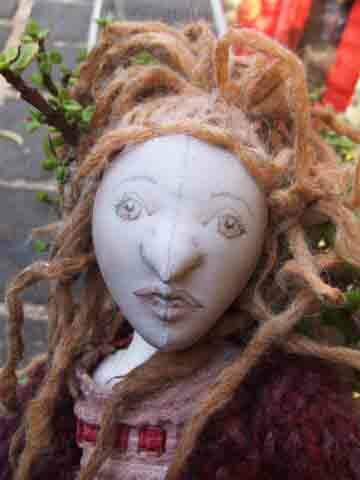 I made some dreadlocks out of wool to see if her strangely shaped head improved with hair. It didn’t. This morning I hopped up and started sewing a new head, to my own pattern, adapted from the one in the book. I had to make a couple of minor modifications to my pattern before it was right, and then she looked fantastic. Just having a good head has inspired me so much. 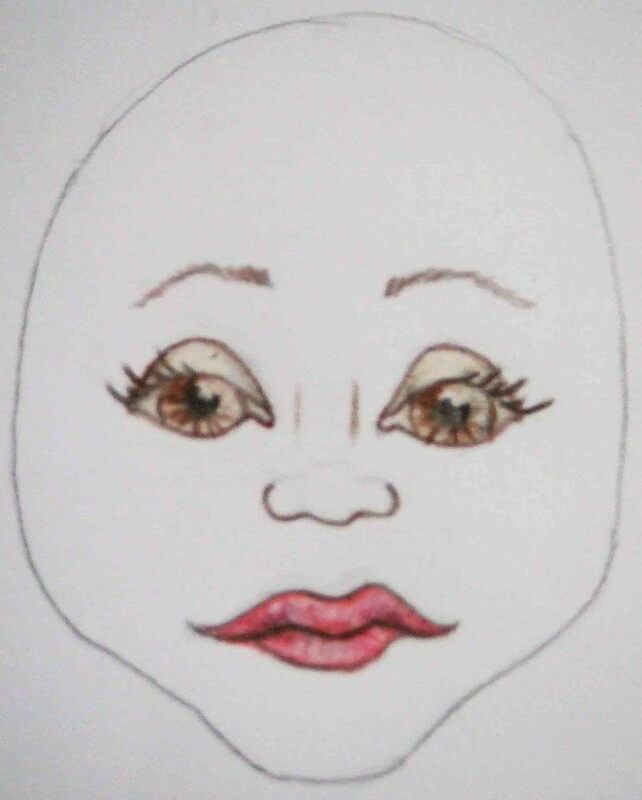 I gave her a really big nose, quite hooked, but a fairly pretty face – so she isn’t a witch or troll or anything, just an intelligent looking woman with plenty of character. I tinted her skin using blush from my makeup kit, drew in her features with pencils, and sculpted her face a little with a needle and thread. I actually thought the sculpting didn’t do much for her. Since the wool I used to make the dreadlocks is white, I had to colour it. I dug out my old paints from high school and found a “raw sienna” colour which I thought was the most natural looking of the ready-made colours. 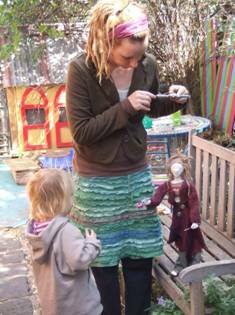 Ironically her dreadlocks are now exactly the same colour as my hair, and in fact look amazingly real. I’m so very happy with how she’s looking now. She’s awaiting the rest of her dreadlocks (rolled, painted and currently drying), and some legs. The legs are giving me real trouble because they are made of dowel and have a special joint at the knee, but I’m not good at woodwork. I’ve come up with this theory that I could cut the dowel to length, then use Fimo modelling clay to mould the joints, and put a hole in the bottom of each one, ready to screw it onto the dowel. Tomorrow I’ll have a go at it. I completed the knee joints on my marionette – worked well with Fimo. Lucky for me Paula helped screw them all onto the dowel as they were rather fiddly. Anyway the knees now work as they are supposed to, if a little loosely! I sewed on all her dreadlocks last night, and started dressing her. She’s wearing the ends of some khaiki pants I bought from the op shop a while ago and had already chopped up for something else, plus a scrap of fabric from a dress I made a while ago, for her skirt, and a scrap of an old singlet of mine for her singlet. I want her to wear a jumper but I haven’t found the right thing that I’m happy to chop into. I may have to go to an op shop and buy something specially. In the meantime, to hide her rope arms, I made her some sleeves out of a khaiki fabric but they look a bit twee because they match her pants so perfectly. I’ll take them off and replace them with something else when I find the right garment. I’ve really bonded with her now, and as a result am so inspired to work on all her details. Still need to do a little more work on her hair, stitch her clothes to her body, add some buttons and details, then it’s time to break out the fishing wire and attach her strings. Oh, and I’ll make her some sandals too, but I might leave that till last of all because I haven’t quite worked out their details. I was working on her after dinner at my family’s house last night, and my sister named her Bronwyn. I think it suits her perfectly. I ended up knitting the jumper for Bronwyn, my marionette. I was too impatient to wait till I could get to an op shop and had plenty of time for knitting during the two days I was in Tasmania for my gigs. I found some wool in my scraps bag that I thought was just perfect. Once I’d stitched it up and put it on her though, it looked very “hot off the needles”. I decided I’d have to age it a bit. I soaked it in some tea and tried rubbing it with a plastic bag – I’ve seen someone do felting with a plastic bag, but it didn’t seem to actually have that effect when it was me who was wielding the bag. Oh well, it did improve the jumper a bit, especially all the stretching and pulling I did. Eventually I dug out my acrylic paint and rubbed some into the edges around the sleeves and hem. This improved the texture a lot. I think paint is a good method of “ageing”. Her skirt looks a bit new too and will need some work. I feel disproportionately exhausted after the trip to Tasmania, and even though I had a Jesse-free afternoon, I was too tired to actually do any of the work I’d planned to do. I’ve been so inspired lately it’s been easy to steal every little moment to work on her, even if it’s just a few stitches. But today instead I’ve just felt daunted and overwhelmed. I’m on the home stretch – she’s nearly done, but suddenly the remaining tasks seem insurmountable. Now I think I’m getting a cold, and this is why I’m struggling – not just with sewing, but with domestics too. Remaining tasks are to stitch her feet back on – my previous attachment was no good as they kept wobbling sideways. I’ve decided I need a less flexible method of attachment and have modified her accordingly; add a patch to the jumper and age the skirt a bit; make some sandals. I haven’t quite been able to work out the details of how I’m going to do this and what materials I will use, so I’m a little bit stumped on this one; sew a bag to store her in (so her strings don’t get tangled); improve the crucifix I made out of papier mache, and maybe paint it; attach her strings. Paula and I have been talking about the show I want to make with her, coming up with a vision. I think I will lay down a piece of hessian to create the floor/stage. Sergio’s marionettes were outside, as if in a park, but I think I will create a home-space for Bronwyn. 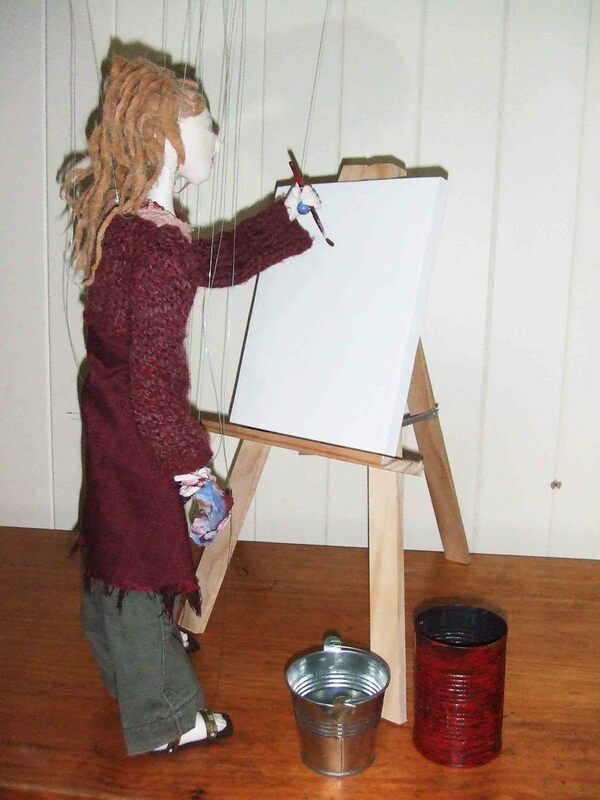 She will be an artist with an easel, a canvas in progress and maybe a couple of other canvasses lying around as well. I’ll sew her a stripey mattress and add some coffee stains and a quilt scrunched at the foot of the bed. I’d like her to have a sink with a mirror over it, and also a floor rug and a rubbish bin. Paula suggested a musical instrument with some sheet music. I’m also thinking of some kitchen-related items: a gas bottle with a cooktop above it, a pot with some food in it, and maybe a bowl with the remains of a meal in it. Paula also suggested some factory fittings, to evoke the warehouse that she lives in. She is a squatter, and at the front of the stage is a large “Planning Permit” application sign. I would like the show to impart some message about squatters, the political reasons they might choose this lifestyle, but exactly how to do this I’m not sure. Paula and I discussed how there’s all this talk about what a great city Melbourne is for arts and culture, how “valued” they are, and yet there is so little funding for artists and they often end up as fringe dwellers if they are truly committed to their work. They are contributing something important to our society and yet are considered bums and dole bludgers because of their lifestyles. Exactly how all this might be portrayed, I’m not sure. The challenge is to make it subtle and yet clear to those who want to absorb the message. More thought needed. I so enjoy my chats with Paula about it – and for the most part I feel inspired and challenged, rather than daunted, at all the work ahead of me to create this show. My lethargy seems to have eased today and I managed to make Bronwyn’s sandals, sew a bag for her to live in, reattach her feet, age her skirt with some sandpaper, stitch her jumper down, and create a rag and paintbrush for her to hold. Still waiting for the last two items to dry, then I can attach them, and give her all her strings. I hope to do this tomorrow if Paula takes Jesse out for a couple of hours. Bronwyn is finished! I did the final touches this morning and then attached all her strings. Unfortunately when I tried to make her walk she went completely pidgeon-toed. I think it’s the knees: the joints I made are just too loose. Rather than fix them, (a highly complicated job) I took off the feet and re-attached them yet again in a more turned out position. Now when she walks the toes go straight and it looks quite acceptable. Her legs still walk strangely but it’s hard to know how much is my amatuer puppetteering and how much is my dodgy handcrafting. She is, inspite of my amatuerish beginning, very delightful, and as I took her for my first practice walk/play, Jesse was mesmerised – he happily played with her for ages, including taking her for a ride in his doll’s stroller, asking her to paint his matroshka dolls, and giving her a hug when she asked for one! Maybe my practice sessions will turn out to be fun for Jesse too. It’s been seven days of intensive work when I’ve made use of every possible moment I can get ahold of to work on her, and before that another seven days of thinking about her and doing little bits here and there. I feel exhausted from the intensity, and am happy to do a bit of a stocktake on my life. The drawers are finished! I’m very happy with how they’re looking. Despite starting out life as a very plain chest of drawers, they’ve now been converted to a dresser with the help of a “wall plaque” and a bevelled mirror I found in a craft shop. First I painted them yellow, then red, then green, and finally I sanded them back to reveal the layers underneath. It’s just the right height for Bronwyn to examine herself in the mirror and shake her head in disgust. Next step is to put some bottles, burnt down candles and photos on the top of the dresser, and have some clothes trailing out an overly-full bottom drawer. But as I said, I’m trying to slow down, so yeah, that can wait a little. I also managed to finish the birth story I began a fortnight ago. I dreamed up the idea for it in the middle of the night as I lay in bed, waiting to go back to sleep after a toilet trip for Jesse. It was really a speculation on how birth might be, if I ended up doing it again – not that I’m planning to. Anyway I enjoyed writing it and am very pleased to have turned out a completed story, given that the last one I finished was over ten years ago. I’ve also finished stitching on the applique panels to the quilt I made for Jesse’s bed. They look good. I need to put a doona inside now and spread it on a bed so I can see it for real. It was pretty fiddly stitching the applique pieces down though, and would have been much easier to attach if I’d done it before sewing on the backing. Maybe for the next quilt. But then again – it’s easier to make the entire quilt in one go and then slowly, at leisure, add applique pieces until I’m happy with it. I can’t decide which approach to use. Paula and I have been cutting the pieces for the next one – we’ve had two sessions so far and probably need at least another two to finish it, as there are so many fabrics and I did smaller pieces this time. Di and I spent a good chunk of today making this easel for Bronwyn. (Thanks Di!) I’m so happy with how it turned out. I learnt quite a bit from Di and was also able to put to use some of the tips I picked up from Matt when he helped me with the knees. My confidence really picked up, and I was even looking at the leftover wood at the end and wondering what other furniture I could make her with that. 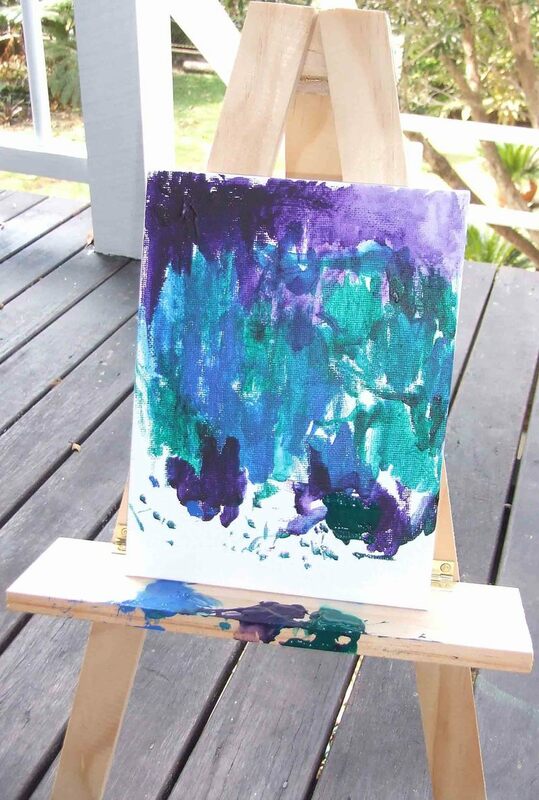 Once we’d finished the easel we had a little play in the garden to see if I could actually make her paint. The brush strokes were all over the place, but I think with some practice and some lead-weights in her hand I can probably get it happening. At last I was able to test out a very satisfying sequence: she sees the easel and canvas, goes to it and has a good stretch, then gets to work. Once it’s finished she turns to Di for some applause and takes a bow. Next it’s off to the tip jar to ask for some money. When Di doesn’t give it, she stomps on Di’s foot very grumpily. Di asks, “Do you want some money?” Bronwyn nods. “How much?” “Lots” signs Bronwyn. Di puts money in the tip Jar and Bronwyn counts it and is so happy she does a little dance. Big thanks to Di and she gives her a hug and a kiss. Then she’s tired. Rubs her face in her arm, heads off to her mattress, lies down and goes to sleep. Of course, I did all this with lots of wobbles and lurches from Bronwyn – I have a lot of practice to do now to keep her steady. The last few days I’ve used my spare moments to work on Bronwyn’s home, and then I set it all up on the back veranda. It all still needs a bit more work in the small details, but overall I’m happy with how it’s looking. It still needs the planning permit sign and stand to put it on, and perhaps a washing line with some clothes strung on it. 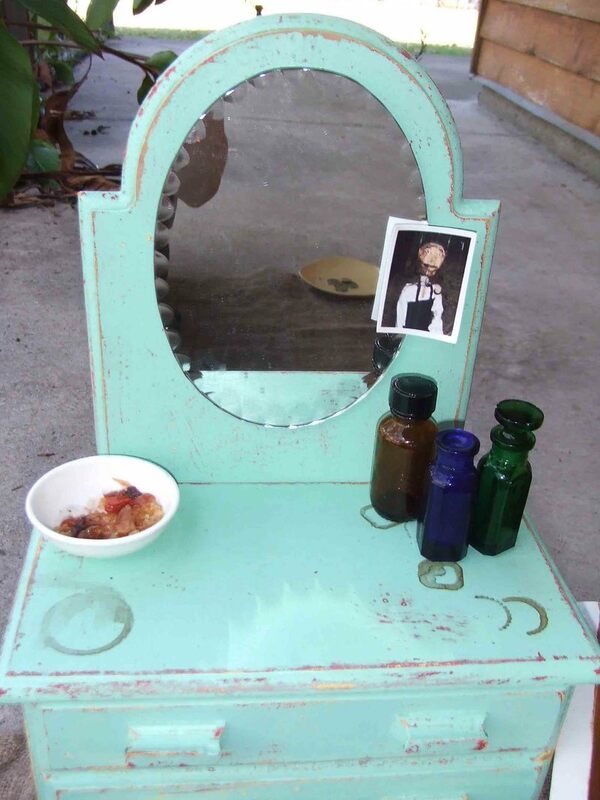 I also want to fill in some little details – like a burnt down candle and some bottles on her dresser, some rubbish in the bin I made her, a miniature snapshot of Sergio’s marionette tacked to her mirror, maybe a book beside her bed. Yesterday I hoped to simply start making the mattress, but I ended up sewing the whole thing. It still needs a few finishing touches such as ties (instead of buttons) to hold down the bulk, and some coffee stains to make it look old. 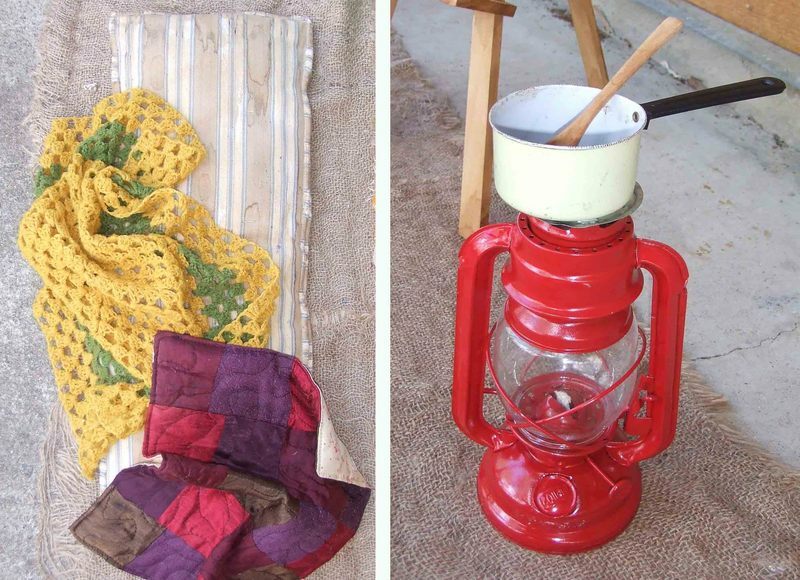 I also made the rag rug for the floor by cutting up an old rug that we were chucking out. I stitched together several old scraps of hessian I’ve had for years to create a mat to define the stage (and Bronwyn’s home). Then I was still inspired and had a bit more time (everyone was hanging out in the lounge room, chatting and playing, and I was in the thick of it as I cut, measured and pinned), so I made a start on her quilt. I used scraps that I’ve saved for over ten years, all reds, purples and browns, cut into squares and laid out randomly. I was itching to start stitching it together, but instead dragged myself away to clean up the van and do some dishes. Today Jesse is sick and I spent most of the day holding him, but while he slept I was able to hop up and sew so I stitched up the little quilt I was making for Bronwyn. It’s a bit small but I’m hoping that doesn’t matter. I’m very happy with how the stitching has turned out, as I just went with a random swirl pattern and didn’t bother to practise it or anything. I finally got myself organised and gave Bronwyn her first painting session today. For the first ten minutes I had this sick, sinking feeling that there was no way this was ever going to work. The paint just wasn’t going on properly, I could barely get it onto the brush in the first place, and it looked like the random scribbles of a two year old. However, with some experimentation I discovered that adding more water thinned the paint and made it go on more easily, and I was also able to work out a set of movements that resulted in actual paint on canvas. This is the final result of her first session. It looks like she’s graduated to a primary-schooler. I also managed to get paint on her face (argh! 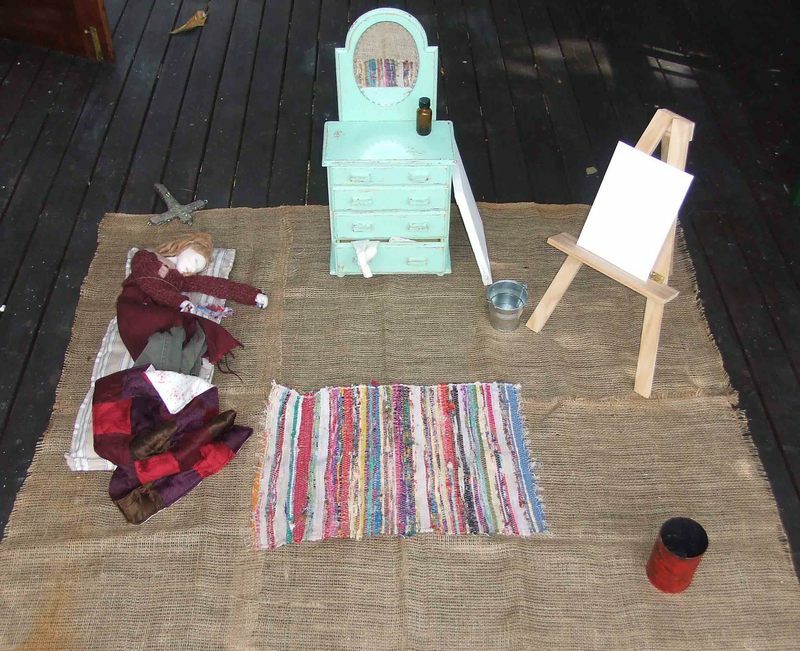 But it mostly came off with the aid of a toothbrush) and to spray paint over her hessian floor, several other of her props, and the veranda and kitchen door. What a clean up! I can see the suitcase is going to need to contain sufficient clean up gear as well as props. After she’d finished painting I set Bronwyn aside and painted a background for her next painting. It’s red and a tawny gold colour. I hope she’ll be able to add a design so that it actually looks like an aesthetically pleasing abstract work, but we’ll see how we go with that. I’m itching to get back to work and do her next painting session tomorrow. This morning I had another go at painting – now that I knew what Bronwyn could do, I was better able to work out some colours and a design. You can see the canvas at the start of the show that I created, and then Bronwyn’s addition during the show. I think the addition is dramatic enough to make it seem like it could be a “finished work” and the beginning is simple enough that it doesn’t look finished, but the overall result is rather more arty than yesterday’s attempt. When I’d finished there was a fair bit of paint left over so I used it to prepare the other canvas for my next session. Hoping to have another go this afternoon while Jesse sleeps. 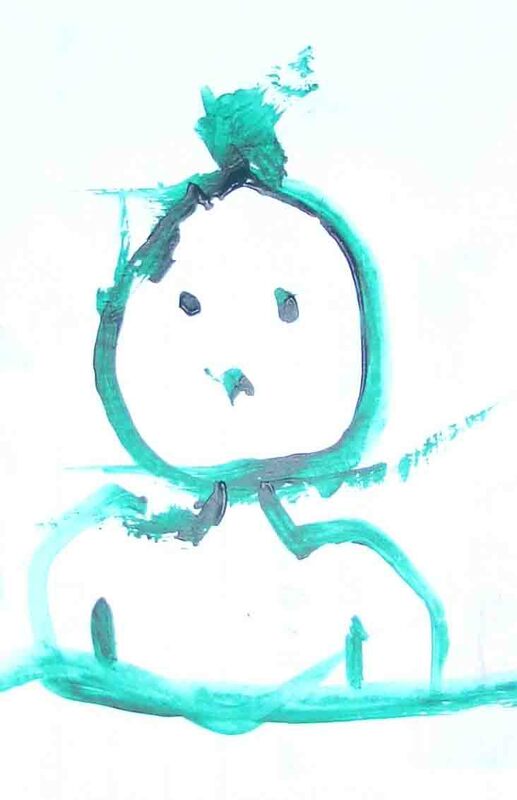 After my most recent showing, one of the suggestions that came up was that Bronwyn should paint a face, as during that show she did an abstract work of an audience member. The feedback was that it shouldn’t be abstract, though neither Paula nor I agreed with that. Nonetheless, I did decide to have another crack at a face now that I’ve sewn new weights into Bronwyn’s hands. This is her first effort at a face and I reckon it’s not bad, especially considering that a week ago I thought there was no hope of ever getting her to do anything other than up-and-down brushstrokes. Aside from yesterday, I’ve been practising Bronwyn every day, but I’m finding my practice sessions pretty frustrating. There seem to be a million obstacles to my practice. Paula was watching Jesse in the bath on the back veranda, and told me, “Be free.” So out came Bronwyn with her newly weighted feet and hands. I’d only walked her around the veranda a few times when Paula asked if I could watch Jesse in the bath while she did a couple of chores. Sure. Only a minute or so after she goes, Jesse announces that he’s finished in the bath. Ok, so I put Bronwyn down and wrap him in a towel, dress him, bring him into Bertha, and since Paula is still occupied I made a start at putting him to sleep. By the time Paula took over and I could go back to Bronwyn, I was hungry. I just can’t make myself practice with low blood sugar, so I heated some food and ate it. Then just as I was heading out the back door, Ian got home and asked me a couple of questions, which led to a bit of a chat. Finally, at long last, I got back to Bronwyn. This seems to be the story of my practice sessions and I find it difficult enough to motivate myself the first time around, let alone the second, third and fourth time as well. I think I might need to scout for a less visible location than the veranda, somewhere a bit less accessible to everyone. Also Paula and I made a plan for next week to give us some more structure, and I’m hoping it will be easier to set up a system for practising like this. I’d much rather do a focussed hour first thing than have it drag on all day as I try to do a little bit here and there. While the show is far from finished and I have plenty more crafting to do to complete it, I am slowing down a bit now. I think it’s time for me to introduce some other projects. It might help to lift me out of this weary, uninspired state I’ve been in the last few days. I’ve been working hard on Bronwyn, practising most days no matter where we are – it’s good practice for me setting up in all kinds of places. Since the showing I did two weeks ago, I’ve developed quite a bit of new material, made lots of smaller props, and went and bought the dress I liked so much to wear as my costume. The photo above is her home with all the newest developments. 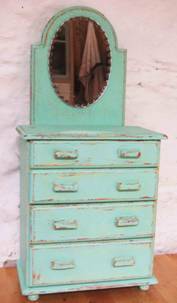 This is a close up of her dresser. 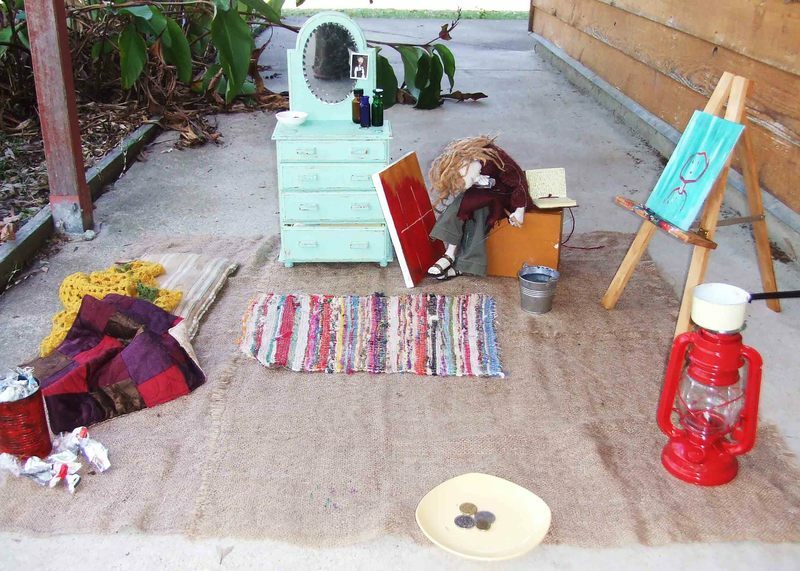 Notice the coffee stains on the surface, and the tiny photo of Sergio’s puppet – Bronwyn’s boyfriend? Or perhaps just a friend.? I also bought the ceramic bowl and then made her some scungy old food. I’d been racking my brains as to how to do this, and finally decided to try stirring glue through last night’s dinner and spooning it into her bowl. It’s quinoa with a Moroccan tajine – yes, actual leftovers from my dinner! It’s worked well so far with the glue, dried out quite nicely thanks to being left in the car for several days. No sign of any mould yet. An ant (an unusually small one) crawled into it and I picked it off before realising that it would have been most authentic had I just embalmed it with glue and left it there. I’m still looking for a small enough candle to put in one of the bottles on her dresser – when I finally find it I’ll burn it down so there’s plenty of wax dripping down the side of the bottle. I’m also hoping to find a tiny metal spoon or fork to put in her dinner. 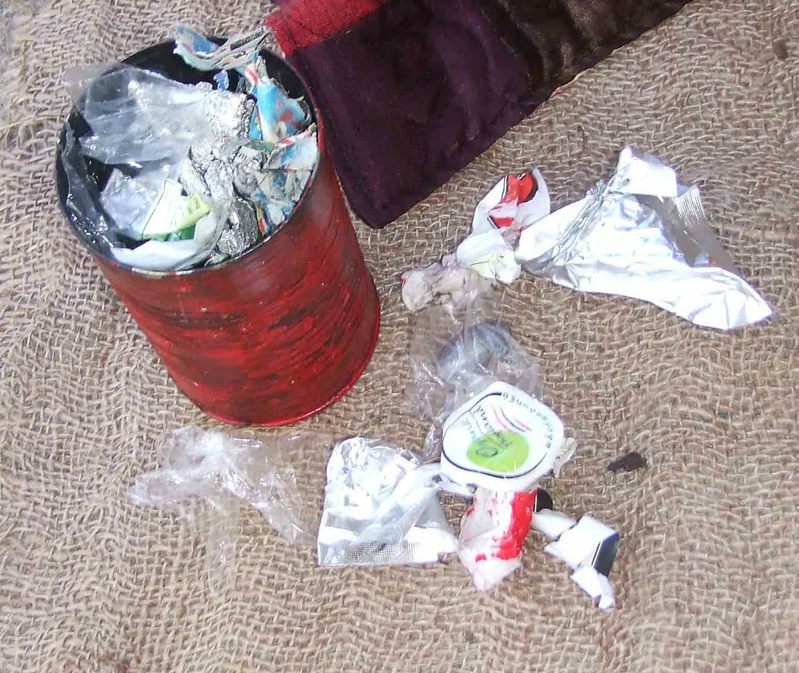 Here you can see the close up of her rubbish bin – it’s actually taken me a while to amass appropriate rubbish for this. And I had the problem that the pieces scattered around the bin kept blowing away in the breeze. I’ve now discretely strung them onto a piece of thread, and in the middle of the thread is a lead fishing weight. Now it can blow around but it can’t go very far and I’m happy with that. I’ve also done some work on her bed – ageing the mattress with multiple layers of coffee stains (that’s how you get the water marks, leave the first layer of coffee to dry, and then the second layer will mark nicely), and putting ties in it to keep it nice and flat. I managed to resist putting spots of dark red in the middle of the mattress! I had sewed the quilt, but it seemed a bit bare and sparse, so I was happy when I found the crochet blanket in an op shop. It was part of a much bigger blanket and I cut off the excess – leaving a very neat little piece. The blanket is perfectly thin and floppy so scrunches up nicely, but the quilt is a bit stiff and tended to spring out and sit flat. I’ve put some pins in it to hold it in a crumpled state and that’s working nicely. I found the cooking pot in an op shop and it’s just old and dirty enough to look very authentic. The wooden spoon was a gem of a find in a homewares shop, and I’ve aged it with the coffee stains to help it along. I was wanting a single gas bottle with a hotplate burner on top to use as her stove, and this lantern seemed a fairly good approximation. I had thought of using some sort of metal frame above a tea light candle, but the candle keeps blowing out in the wind. The lantern might work well as a light for the whole set – I don’t know if it’ll be enough to light it and do the show in the dark. I must test it out. I’m worried that it looks too much like a human-sized lantern and not enough like part of her miniature set. It definitely looks too new and sparkling. It is always very difficult for me to bring myself to ruin her belongings by ageing them, but they do fit in so much better once I’ve done it. Di suggested perhaps I could build a stove around the lantern. I’m also thinking of chopping off some bits but am unsure where to start. There’s a shop called Reverse Garbage in Brisbane – I might pop in there to see if I find any inspiration. Here’s Bronwyn sitting on the box I borrowed from Ian and Chelsea, with her art-journal. I’ve developed a sweet little routine in which she sits on the box, crosses her legs and swings her feet, then leans over to read some of a previous entry. After a bit she picks up the book, puts it on her knee, and starts writing – notice she’s holding a small pen instead of a paintbrush. Quite by accident, the way I sewed on her paint brush makes it easy to slide the brush in and out, and she is also able to hold various other apparatus. 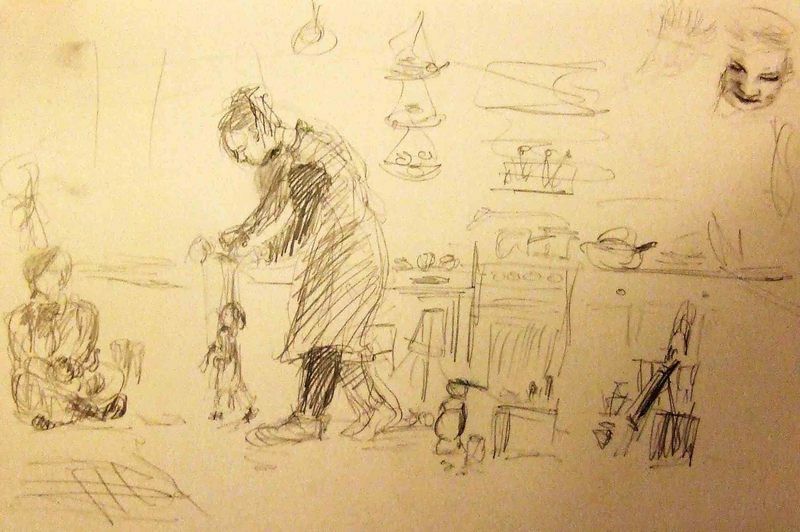 During the show I swap the brush for the pencil and also for the wooden spoon so she can do some cooking. Paula has been writing entries into the art-journal and they are just delightful – barely legible scribbles teamed with diagrams of things she might make or paint, and the odd shopping list and address or phone number. I tried out an idea Di had, in which she falls in love with someone from the audience, then goes and writes about them. After she falls asleep I flip through the journal to find that page and hand it to the person to read. They read it out and it’s a love poem about that person. I tried out the whole thing with Paula, who didn’t know what was coming, and she said afterwards that it was confronting to read out to the group (there was no actual group there that time, but she got the idea), and that it seemed a bit mean for me to be going through Bronwyn’s journal while she slept. I can still do that sequence if I want but for now I’ve just got her falling in love, then going and writing about the person. Peek through the window of the abandoned paint factory and catch a glimpse into the life and work of Bronwyn, squatter and artist. 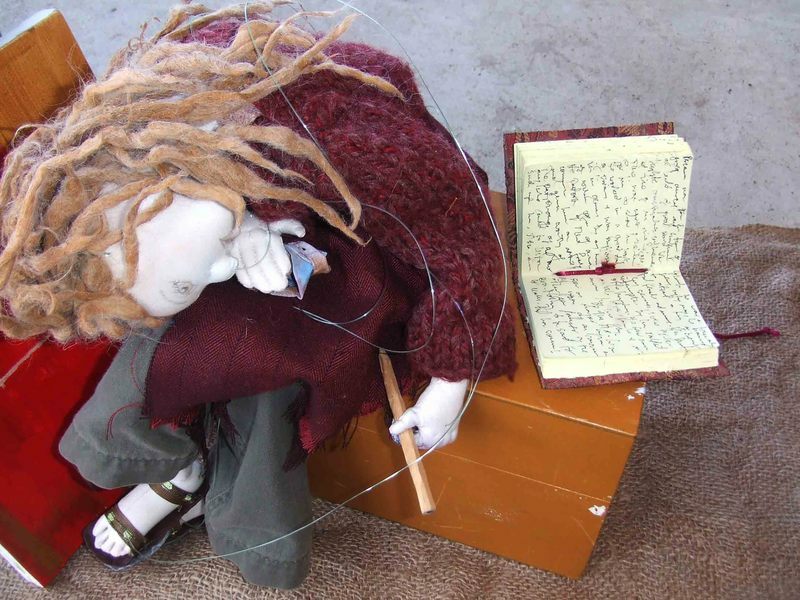 Bronwyn is a marionette, feisty and passionate, whose bohemian existence includes painting miniature canvases and logging her dreams into a faded artist’s journal. Watch and be drawn into this intriguing world in miniature which will delight and amaze as Bronwyn comes to life. And if she spots you staring – she might even come out to play. This act is finally available for sale, and on Friday night I had a little showing at my place for a few friends, and decided to actually allow people to put real money on the plate for the first time. My plan at this stage is to sell the act for private performances rather than busk, so the tips added to the plate are pocket money more than anything. On Friday night my earnings netted me the amazing sum of $5.75. Wow – I’m rich, eh? It was interesting getting feedback from people – many people commented that Bronwyn’s asking for money made them laugh and her requests were up there with the favourite bits of the show. They also liked the shoe polishing at the start and several people commented that they felt she was “real”, a big compliment for me. One of my friends brought his housemate, Luke, an artist, and while he was watching the show he did this lovely little sketch. What captivated me most, I think, was actually the rendition of our kitchen behind the set – it touched my my happy-to-be-home nerve with its familiarity. Last night was the launch of The Paint Factory – Through The Window. Although I didn’t feel as nervous as I sometimes get with a new act, in terms of the pounding heart and butterfly stomach, the night before I dreamed that I was about to go onstage and I had left my costume at home. I woke to tend Jesse, and when I fell asleep again I dreamed that no-one came to the launch and the room was almost empty. The night went on like this – Jesse woke me about four times, and each time I went back to sleep there was some variation on launch-disaster. After a shaky start due to my manager being very late to arrive and set up, we managed to get back on track and weren’t even running very behind time. A dozen or so of my friends showed up, and I had thought there was a modest turn out. But half way through my act, when I looked up at the audience, I saw row after row of rapt faces, gathered close to the stage and utterly engaged. I was stunned by their response. Bronwyn came out in silence, but when the music started, Paula said everyone came to the front to watch. After that, even I could hear the audience, feel the energy, that they were with her, laughing at her temper, cheering when things went right for her. It felt magical. And the very best thing was that afterwards, Paula said my technique was great – that I had reached the level of Sergio, the man from Chile who inspired me and taught me. What an honour. I was thinking that all those people I saw when I was performing, must have gathered by fluke, or come to see some of the other acts that were also on, but after my show finished, the room emptied out quite quickly, and I realised that they had all been there for my show. I felt a little sorry for the performers on directly after me because there was a sense of anti-climax and departure, but Paula said the night was about my launch, and it definitely achieved that effect. I went to sleep feeling so happy, thinking of the journey I began in February when I met Sergio, and completed last night. Yay! 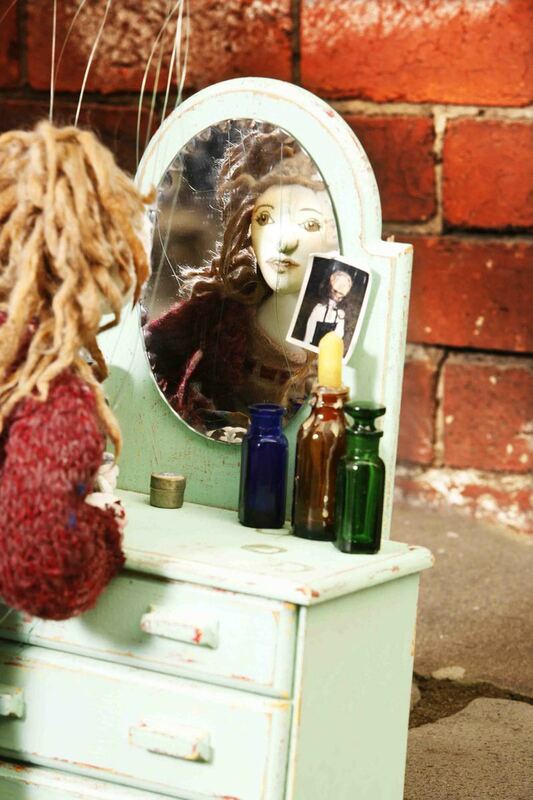 This is a short film I made of my marionette, Bronwyn, in her home, the abandoned paint factory. 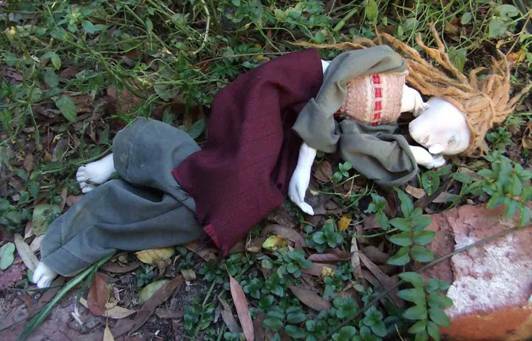 Read about the creation of my next puppet show, The Grimstones.